The music of American composer Mark Grey has been commissioned or premiered by such organizations as the Los Angeles Philharmonic, Atlanta Symphony Orchestra, New York Philharmonic, National Opera of Belgium La Monnaie | de Munt Opera, Carnegie Hall, CalPerformances, Los Angeles Master Chorale, Kronos Quartet, Berkeley Symphony, Phoenix Symphony, Green Bay Symphony, California Symphony, Los Angeles Children’s Chorus, Meet The Composer and others, along with festivals at Ravinia, Cabrillo, OtherMinds, Perth International, and Spoleto. Mr. Grey has been commissioned by the National Opera of Belgium La Monnaie | de Munt Opera to write an evening length grand opera to premiere in March 2019 in Brussels. The subject of the opera will be Mary Shelley’s Frankenstein – to commemorate the novel’s 200-year anniversary. A 35-minute symphonic version of the opera was premiered by the Atlanta Symphony in 2016 and co-commissioned by the Berkeley Symphony. Opera Wire – 10 Must See Operas In 2019 [International Edition]. No 7 Frankenstein – La Monnaie. The New York Times – ‘We Feel a Kinship With the Creature’ (Oct 2018). San Francisco Chronicle picked FRANKENSTEIN SYMPHONY in its top five classical music choices for 2016. The world premiere of his latest chamber symphony, Fantasmagoriana, was performed in 2017 at Disney Concert Hall and co-commsioned by the Los Angeles Philharmonic and Jacaranda Music. In 2016, a solo violin work for Jennifer Koh premiered at the New York Philharmonic’s Biennial. In 2013-15, several other commissions were awarded by the Atlanta Symphony Orchestra, the Los Angeles Philharmonic, among others. During a two-month period in the spring of 2011, Mr. Grey received three world premieres in three of the world’s great concert halls. The first work was for soprano Jessica Rivera and The MEME Ensemble, titled Ātash Sorushān (Fire Angels), a Carnegie Hall, Cal Performances and Meet The Composer co-commission, which premiered at Carnegie’s Zankel Hall. The libretto for this work was created by poet Niloufar Talebi. The second work, titled Mugunghwa (Rose of Sharon), for violinist Jennifer Koh, the Los Angeles Master Chorale, and chamber orchestra premiered at the Walt Disney Concert Hall in Los Angeles. Finally, Mr. Grey was commissioned by the Atlanta Symphony Orchestra to write a fanfare for orchestra celebrating Robert Spano’s tenth anniversary as Music Director and Donald Runnicles’ tenth anniversary as Principal Guest Conductor. Grey was the Phoenix Symphony’s Composer-In-Residence for their 2007/08 season. 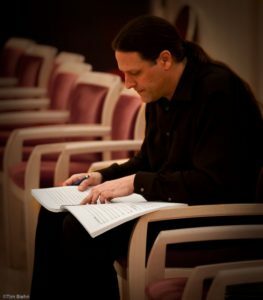 He composed a 70-minute oratorio, Enemy Slayer: A Navajo Oratorio, for baritone, chorus of 130 singers, and full orchestra, which premiered in February 2008. The story of the oratorio was based on a Navajo creation mythology story. The residency was funded by Meet The Composer and the League of American Orchestra’s Music Alive! program. In September 2007, a 10-minute full orchestra work was premiered during the residency period, titled The Summons. The oratorio was recorded for Naxos Records and released March 2009. Enemy Slayer: A Navajo Oratorio has also been performed at the Colorado Music Festival in July 2008 and in Salt Lake City in May 2009 with the Salt Lake Choral Artists. Other recent commissions include works for the Los Angeles Philharmonic’s Minimalist Jukebox Festival, Kronos Quartet, Colorado Music Festival Orchestra, Leila Josefowicz, Paul Dresher Ensemble, the California EARUnit, and Joan Jeanrenaud (former Kronos Quartet cellist). Bertoia I and II, a two movement composition, was included as part of Kronos’ evening length program Visual Music, which has been performed at Theatre de la Ville (Paris), Sydney Opera House (Australia), Perth International Music Festival (Australia), Barbican Centre (London), Het Muziktheater (Amsterdam), Carnegie Hall (New York City), Royce Hall (Los Angeles) and Yerba Buena Center for the Arts (San Francisco). During her 2005/2006 season, violin prodigy Leila Josefowicz toured Grey’s San Andreas Suite for solo unaccompanied violin as part of her recital program. Performances have been worldwide, including Barbican Centre in London, Warsaw Philharmonic Hall, Carnegie Hall in November 2005 and Ravinia Festival in the summer of 2006. As well, she recorded the recital program for Warner Classics, released April 2005. In the summer of 2006, Ms. Josefowicz premiered Grey’s violin concerto titled Elevation at the Colorado Music Festival with conductor Michael Christie, and then at the Cabrillo Music Festival with conductor Marin Alsop. In April 2009, Molly Morkoski premiered a new solo piano work titled A Rax Dawn at Symphony Space in New York City. In August 2009, Areon Flutes premiered a new flute quartet titled The Alluring Wave at the 2009 U.S. National Flute Convention. In July 2005, Michael Christie premiered a new work for orchestra titled Pursuit, as part of the Colorado Music Festival. Grey is an Emmy Award winning sound designer who made history as the first sound designer for the New York Philharmonic at Avery Fisher Hall (On the Transmigration of Souls, 2002, which also won the Pulitzer Prize in Music) and the Metropolitan Opera (Doctor Atomic, 2008 / Gilbert; Nixon in China, 2011 / Adams; Death of Klinghoffer, 2014 / Robertson; The Merry Widow, 2015 / Davis; Bluebeard’s Castle/Iolanta, 2015/19 / Gergiev/Nánási; L’Amour de Loin, 2016 / Mälkki). He has collaborated intimately with composer John Adams and several others for three decades. He designed and toured extensively with Kronos Quartet for nearly 15 years. Mr. Grey’s association with Lyric Opera of Chicago has encompassed several productions since 2007, most recently West Side Story (2019), My Fair Lady (2017), The King and I (2016), The Merry Widow (2015-2016), Carousel (2015), The Sound of Music (2014), Doctor Atomic (2007). He has designed many productions for the Park Avenue Armory in New York City which include St. Matthew Passion (2014) with the Berliner Philharmoniker under the baton of Sir Simon Rattle and directed by Peter Sellars, Kaija Saariaho Circle Map (2016) with The New York Philharmonic / Esa-Pekka Salonen, William Kentridge The Head and the Load (2018), Pierre Boulez Répons (2017) with Ensemble intercontemporain / Matthias Pintscher, and many more. His sound design creations have been seen and heard throughout most major concert halls, HD simulcast theaters and opera houses worldwide. During his attendance at the California State University at San Jose, both B.A. and M.A. degrees were awarded in Composition and Electro-Acoustic Music under the direction of former International Computer Music Association President and electro-acoustic music pioneer Allen Strange, along with composer Pablo Furman. Two unique musical lifestyles began to develop in composition and technical areas. While working as the first editorial intern at Keyboard Magazine, publishing technical materials and a monthly column from 1990 through 1996, he began to receive several awards for solo, chamber, orchestral and electronic composition. © MARK GREY MUSIC INC.